Here at TECHGEEK.com.au, we’ve grown a keep sense of cynicism when it comes to leaked screenshots. While we do love to see the latest software goodies early, plenty of people love to take advantage of the excitement by creating fake screenshots. And sometimes they’re so realistic, you would believe them. But the latest Google Babble screenshot maker, allegedly leaked from the project which is said to be combining Google’s communication services into one, hasn’t even put in the effort to make a good fake. As our own Terence Huynh noticed, the same screenshot was leaked exclusively to a number of websites, including Phandroid and 9 to 5 Google, all placing their watermark on top. And this fact alone, as well as the way it was anonymously sent, is the first tip off that it’s a fake. Then there is the true confirmation that it is a fake. The logo in the top left hand corner? It’s a previous mockup by Shen Ye. The creator told his Google+ followers that they’re using the exact image, right down to the gradient, in the ‘leak’. Then there’s the design. It’s basically Google+ Messenger with massive, obviously faked fonts and inconsistant UI elements, such as the vote box. Then there’s the lack of any read receipts, which means that either Google has missed a major opportunity in their leaked app, or that the creator didn’t even remember to include them. 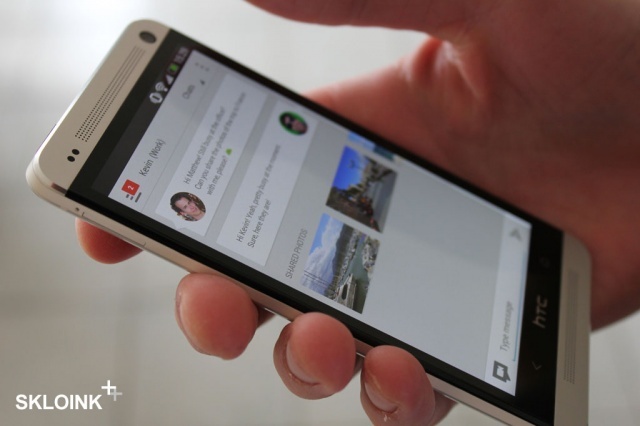 But if you’re looking for some more realistic leaks, Skloink.com have shown off a Google+ style messaging app running on the HTC One. So in conclusion, the first screenshots are sadly fake. Hopefully we get some real hints, such as the image above, about the new service soon, which likely the true part of this rumour, due to its confirmation at the last Google I/O. And hopefully the next ‘anonymous’ leakers put more effort into exploiting the excitement of Google fans. If you’d like to send us fake screenshots of upcoming Google services, feel free to mail tips@techgeek.com.au. The best one will win a fake screenshot.